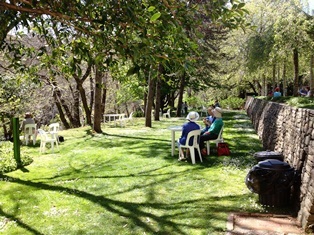 The Everglades in Leura, beautiful scenic gardens, the perfect spot for a romantic picnic, a walk, time with the kids, somewhere to take nana for the day and more. I was with my best friend, Faye and my daughter Luana. We paid our $5 entry fee and started from the left of the visitors centre. 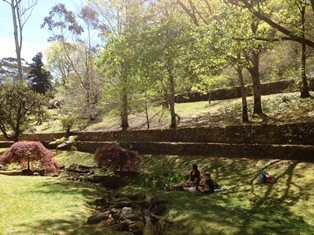 I have to admit that I was dragged to the Leura Garden Festival and agreed to go on the proviso that we only visit one of the 11 gardens. 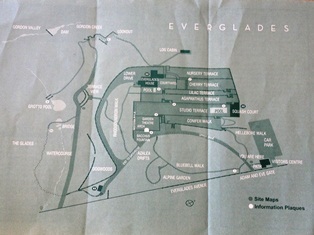 The Everglades Historic House & Gardens opens every day except Christmas Day & Boxing Day. 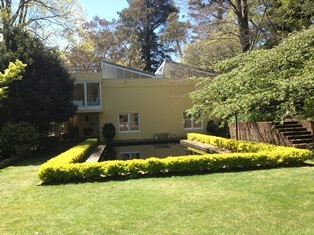 It is 13 acres of European style gardens, native bushland with panoramic views, terrace lawns and winding paths. The flower festival is now over and I was fortunate enough to go and have a look at what should not be kept a secret. Starting from January, February and March, the Everglades offer fuchsias, daylilies, agapanthus and dogwoods. March, April and May the leaves start to fall (must go). June, July and August, winter bulbs include snowflakes, crocus and early daffodils pop up. 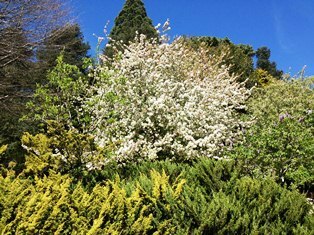 August and September sees the early flowers for Plums, currants, star magnolia and so much more. October is when the beautiful Bluebells come out to play as well as the azaleas. 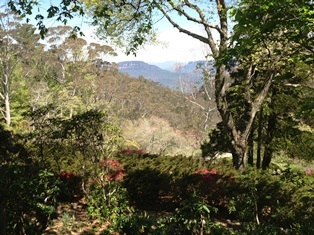 November is the time for the rhododendrons and wisteria to reach their peak. And December is the evergreen dogwoods blossom and early summer flowers like Lillies and fuchsias. They have so much to offer all year round. We started at the main entrance as seen on the map, and didn't leave a stone unturned. We followed the first path through the breathtaking Bluebells; they reminded me of the woodlands in the south of Kent, England. 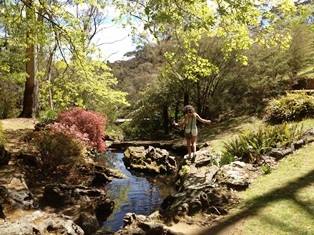 Spring time, nothing feels as good as spring. 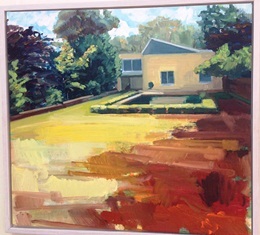 Walking through the garden, we saw a pool in front of a building that was once a squash court in the 1930's, but is now used as an art gallery. Michael Herron, local artist, happened to be there, he had paintings up on the wall and likes to paint in diptych style (dual). There is more about him on his website. 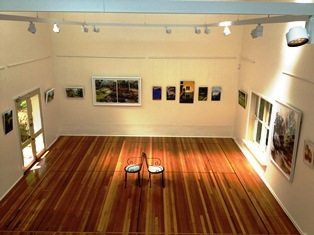 Michael Herron Michael loves being able to paint in the 'old squash court' gallery and is very inspired by the views. 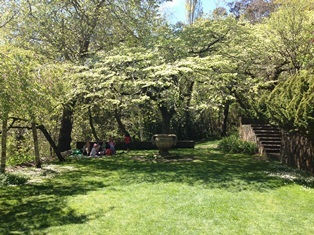 We continued on the path and found the Watercourse, there we saw a mother sitting on the very green grass with her children having a quiet picnic. It was all just so perfect. 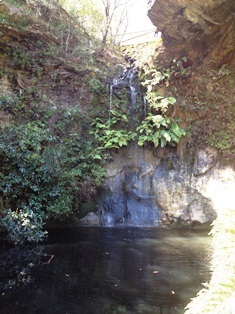 We decided to take the path down to the Grotto Pool and it was worth the effort. It was such a surprise to see a waterfall. Mesmerised by it, we stood and watched in silence for quite a while. 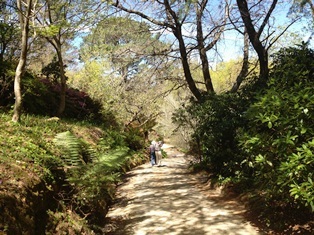 Taking the path back up to the main gardens, we were getting hungry and I could have kicked myself for not packing a picnic as so many people were lying on their blankets or using the picnic tables and chairs that were provided. The smell of sausages sizzling filled my nostrils. Not really a favourite but I thought I'd take a look. 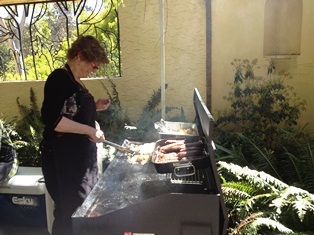 We met a lovely volunteer named Pam, who was happily being BBQ Pam for the afternoon. 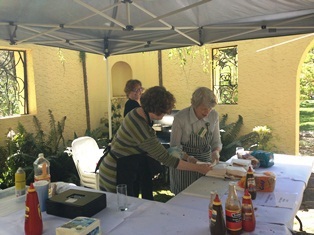 She and her team of volunteers were cooking and serving sausage sandwiches just outside the Garden Theatre and Tea Rooms. It looks like a lovely place. Would love to visit this garden. Thank you, I found this really helpful and plan to take my husband and two little boys there for our next picnic ( perhaps with another family too) . Very informative.